Combi or Sequencer mode for KARMA MIDI recording and playback? This article is essentially finished now except that MIDI Method 3 still needs some significant rework, and the entire article needs a few polishing passes. You want to record the audio and/or MIDI output from KARMA modules into their own separate tracks in your external sequencer. If you record the output of your Main L/R outs while playing a combi or program with KARMA and/or the Drum Track engaged, then your recorded audio signal is a mixture of your keyboard-generated sounds, your KARMA generated sounds, and/or your Drum Track sounds. If you record MIDI at the same time, however, the only notes captured in your MIDI track are the ones you play on the keyboard. The MIDI notes generated by the KARMA modules, and all the controller changes that might be generated by changing KARMA scenes or using the KARMA RTC switches and sliders, are not sent out from the M3 at all when you are in COMBI or PROG mode. So it can be confusing to figure out how to record only the KARMA audio output (either as a whole or selected sounds), or how to record the actual MIDI notes generated by the KARMA modules and/or the CC data generated by taking actions in the KARMA control surface (switches/sliders, scene changes, etc.). Many KARMA GEs use KARMA Wave-Sequencing either to cycle through different oscillator waveforms or simply to override the default oscillator waveform of a program when KARMA first begins playing. For example, on the Korg M3, GE 1232 Snaky Synth-Bass does this. If you play combi I-A036 Alligator Boots and solo Track 10 (which is played by KARMA Module C), you can move Slider 7 in KARMA's Master layer to turn this type of simple "binary" wave-sequencing on and off. When the slider is in the lower half of its range you're hearing the default oscillator waveform for program I-B117 Sine Synth, but when the slider is in the top half of its range you're hearing the wave-sequencing override from KARMA switching that program's oscillator to use a completely different waveform. All KARMA Wave-Sequencing changes are accomplished by using SysEx messages to tell the PCM engine in the Kronos, OASYS and M3 to change the underlying waveforms used by the oscillators in a program. This SysEx message is only around 12-16 bytes long so it is low-overhead and shouldn't be affected by the limitations on SysEx message length that some external sequencers have (such as Sonar HomeStudio). If your external sequencer does not support SysEx, then when you play back your recorded KARMA MIDI tracks to a combi (or song), some tracks might not sound the same, because the SysEx message to select the correct waveform override (or to cycle through different wave-forms) is not being transmitted by the recorded MIDI track. One notable external sequencer affected by this issue is Ableton Live, which currently does not support SysEx even in Version 7. There are basically four different methods to record KARMA with an external sequencer. Some methods require the M3 to send out CC information from the KARMA control surface so that you can record all the KARMA CC envelopes, while other methods tend to work better if you do not record the KARMA CC envelopes. Some methods also require you to record the SysEx messages transmitted by some KARMA GEs. The easiest method to work with is Method 1. It yields 100% predictable and consistent results in all external sequencers including those that do not support SysEx (such as Ableton Live). Methods 2 through 4 are slightly more complex and are generally best suited for when you need to tweak the MIDI notes or other CC or SysEx information that are generated by each KARMA module. On the Korg M3, OASYS and Kronos, the Sequencer mode is more or less the Korg equivalent of "Multi mode". The "more" part is that if you want to simultaneously record anything other than the Global channel (channel 1) to your external sequencer, you must be in Sequencer mode to do so. The "less" part is that you can simultaneously play back multiple channels from your external sequencer when the M3 is in Sequencer or Combi mode. You never want to actually play recorded M3 songs from the internal sequencer when you are set up for recording KARMA MIDI to an external sequencer, because this will often yield very unpredictable (and undesireable) results. In other words, you cannot record KARMA MIDI tracks to an external sequencer by playing back a song that you have already recorded once into the internal sequencer of the M3, Kronos or OASYS. If your goal is to duplicate the MIDI in a song file to your external sequencer, you should use Method 4 to accomplish this. When using Method 1 to record, you do this in Combi mode. When using Method 2 to record, you do this in Sequencer mode. When using Method 3 to record, you do this in Sequencer mode. When using Method 4 to record, the mode is irrelevant because you're working with exported .MID files. A strong reason for using Combi mode for playback of the MIDI tracks from your external sequencer is that you can set up several different combis to all be slight variations of the same essential combi, and then your external sequencer can use bank/subbank/program messages during playback to flip among the various combis. This enables you to achieve results such as different effects settings, or slightly different programs or GEs used by a given KARMA module, etc. Depending on which of the four methods you are using to record KARMA to MIDI tracks in your external sequencer, you will have to make various combinations of the following preparations. Tip: You can create a PCG file that contains nothing but Global Preferences in it. You could therefore create one PCG file to load when you plan to use one of the following recording methods that requires a specific combination of Global settings. You could create a different PCG file to load when you just want to play your keyboard by itself. Loading one of these PCG files as needed is much faster than looking up which Global settings to change every time you switch from recording work to normal playing. When you want to record all the actions you take in the KARMA control surface (sliders/switches, scene changes, KARMA on/off, etc.) to your external sequencer as part of the recorded MIDI, you must set the KARMA CC assignments in the Kronos, OASYS or M3 to their default CC numbers. These same default assignments are required for the M3 to respond to these controller messages when played back from MIDI tracks in your external sequencer. In GLOBAL P2:Controllers, use the page menu and select Reset Controller MIDI Assign. When you do not want to record actions taken in the KARMA control surface, you need to set the KARMA CC assignments to *OFF*. Note that this will also prevent KARMA from responding to KARMA CC messages that are sent by your external sequencer (such as in the track containing your trigger/control notes), so you generally want to use these settings only when using Method 3 to record your KARMA output. In the resulting dialog, press > and select Default Setting. This sets the 19 KARMA CC assignments to OFF. You can save the KARMA CC assignments that you prefer to work with most often as the default power-on assignments by using the page menu to select Write Global Setting after you have enabled or disabled recording of the KARMA CC envelopes. These are the only combination of MIDI settings that will enable you to play the keyboard, pads, and KARMA RTC control surface, with the external sequencer able to capture the KARMA-generated MIDI notes from each channel used by the KARMA modules. Important: For Methods 2 and 3, with these settings you must not pass-thru the MIDI playback of the MIDI channels that you are recording, or you'll end up with a MIDI note loop. (In other words, do not enable your MIDI tracks to play their input from the M3/OASYS back through to their output device, which is also the M3/OASYS.) Unfortunately, you cannot simply disable Local Control on the M3 to achieve this same goal. It may sound "dangerous", but if you forget to set the MIDI track output muting to prevent a MIDI feedback loop, it will not really hurt anything, and won't even necessarily be loud. It'll just make weird noises (or echoed notes) and maybe temporarily lock up the unit, but if you unplug the MIDI cables, the loop will instantly stop and return control of the unit to you, whereby you can change some settings. Note: Of the four possible methods for recording KARMA to MIDI, this is the only method for sequencers that do not support SysEx (such as Ableton Live) that will result in playback that is 100% identical to what you hear when you play it live from the keyboard itself. The other three methods work well only for sequencers that support SysEx. In this method, you use two recording passes to record the "trigger notes" (keyboard/pad notes) onto one sequencer track and then the KARMA CC data onto another sequencer track. Then you use those two tracks to play the trigger/control data back into KARMA, as if you are playing the keyboard. In other words, when you play a KARMA Combi live, you are playing the keyboard on the Global Channel (typically Channel 1). This is being intercepted by the KARMA Engine, and routed into different MIDI Channels for the 4 Modules. To reproduce the performance, all you have to do is record the Global Channel, and play it back into KARMA. It's the same thing as playing it live. The reason for recording this information in two separate passes to two different MIDI tracks in your external sequencer is so that you can focus only on your keyboard playing in the first pass, and then focus only on your KARMA RTC control surface performance in the second pass. This approach also enables you to record several completely different variants of a KARMA RTC performance (each in their own independent MIDI track), giving you the option of auditioning different "backing arrangements" against your other recorded material. You can alternatively choose to adapt this procedure slightly to just record your trigger notes and your control data at the same time in one pass to a single MIDI track, but this is a lot more to stay on top of during the recording process. Another alternative, if your sequencer supports overdub MIDI recording, is to do two passes but on the second pass overdub your KARMA RTC control surface performance to the same track where you recorded your trigger notes in the first pass. On your keyboard, make the following preparations for KARMA MIDI recording (per the preceding sections). Enable recording of the KARMA CC envelopes. Set up Global MIDI for Method 1. 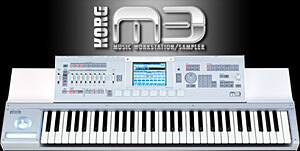 Note that with this Global MIDI setup, your keyboard and its control surface will respond only when at least one MIDI track on your external sequencer is armed for recording (your keyboard passes through the armed external sequencer track back to your keyboard's sound generatorwhich echoes back what you play/touch to the sound generator). Don't forget to change these two settings back when you want to play your keyboard normally again. On your external sequencer, arm one MIDI track for recording the output of Channel 1 from the keyboard and to play the track back to Channel 1 of the keyboard. Set the MIDI input of the track to pass through to the output. On your keyboard, switch to the combi/program you plan to record, and enable the KARMA (and optionally, the Drum Track) switch. In your external sequencer, set the tempo, start the recording countdown, and record only the trigger notes and chords from your keyboard and the pads. Do not make any changes to the KARMA RTC control surface in this recording pass (no scene changes, slider movements, etc). Just stick with whatever KARMA scene you started with to help guide the feel of your playing. When you stop recording on the external sequencer, KARMA will also stop, but you'll have to manually stop the Drum Track because the Drum Track does not respond to any MIDI Common transport commands (this is by design, not a bug). Examine your recorded MIDI track. It will contain only the trigger notes/chords (not any KARMA-generated notes), and will contain no CC envelope data. For the MIDI track you just recorded, specify program change information in the format supported by your sequencer. This ensures that the combi will start in its default saved state, and saves you the trouble of manually setting starting values for all 19 of the KARMA CC envelopes in your control data track. For example, in Ableton Live you would specify Bank 1, Sub-Bank 1, and Program 37 to make the Korg M3 initialize combi I-A036. Now create a new MIDI track exactly the same as you did for the first track and arm it for recording. Be sure to not arm the first MIDI track that contains your recorded trigger notes. Start the recording countdown and this time leave the keyboard and the pads alone, recording only the KARMA RTC control surface in this pass. Just focus on your KARMA RTC performance and make changes to the sliders/switches/scenes on the KARMA control surface. Now play back the two recorded MIDI tracks together and you'll hear your complete KARMA performance along with the notes/chords played on the keyboard and pads. (optional) Create yet another new MIDI track and record a different KARMA RTC control surface performance to it. Now you have two completely different performances available depending on which control data track you play along with the trigger notes track. The advantages of this approach are: you can correct timing, controller moves, scene changes, etc., all without committing the output of KARMA to the sequencer. This means you can change GEs, even change Combis, and use the same recorded track of "trigger/control" information to play the new KARMA setup. You can change the arrangement of the song and edit the KARMA stuff more easily. Stephen Kay has reportedly used this method in the past, especially with single GEs, to do things like this: Record a simply chordal trigger track, for some guitar strumming, then, try different GEs while playing the track, thereby experimenting with different strumming patterns inside the track with other recorded tracks playing. Also, when using this method, you can keep the keyboard in Program or Combi Mode, since the sending of the MIDI from the KARMA Modules is not needed (which is not possible in Combi Mode unless you don't want to hear the internal sounds). Note: This method yields predictable results only if your external sequencer supports SysEx. This method is just another third recording pass after you've created a good trigger/control track as per Method 1 above. In this pass, you play back the trigger/control track from channel 1 of your external sequencer, while recording all the other channels from your keyboard on which KARMA (and optionally, the Drum Track) are playing. When finished, you'll have up to 5 or 6 tracks of MIDI information depending on whether you choose to record the Drum Track. One MIDI track will be the trigger/control track that you created previously by using Method 1, up to four other MIDI tracks will be the MIDI notes generated by Modules A through D of KARMA, as determined by the KARMA CC data captured in Method 1 (and no KARMA CC data is recorded onto these tracks, which would be useless), and one MIDI track will contain the MIDI notes and CC data generated by your keyboard's Drum Track. This is the easiest method, by far, to capture the actual MIDI note data generated by KARMA. Method 4 is faster, but it unfortunately includes the KARMA CC controller envelopes on every MIDI track, which can cause problems when you're trying to reuse the recorded MIDI data. So with Method 4 you must spend a lot of time wiping the CC data from the KARMA MIDI tracks. This method, by contrast, results in KARMA MIDI tracks that are clean of all superfluous CC data. In your external sequencer, load a KARMA MIDI recording that was made by using Method 1. Set up Global MIDI for Method 2. In your external sequencer, play back the recorded trigger/control tracks to ensure that the proper combi is selected. On your keyboard, use Auto Song Setup (ENTER + REC/WRITE) to copy the combi into your keyboard's internal sequencer. You're now in Sequencer mode with the metronome ticking. Press the REC/WRITE button to disable recording in the keyboard's internal sequencer. On the P0-1:Play page, on the Prog 1-8 and Prog 1-9 tabs, note which tracks are enabled for recording. Go to page P3 Track Param, and on the MIDI 1-8 and MIDI 9-16 tabs, set the Status of all tracks that were enabled for recording in Step 7 to BTH. (This is essential, causing the KARMA generator to send MIDI data out to your external sequencer. If you're seeing no MIDI input on your external sequencer, this is the culprit.) Note that you only need to record one track that is used by a KARMA module. For example, if KARMA module C is playing to channel 3 for three different tracks, you only need to record one of those tracks. On your external sequencer, set up a separate MIDI track to capture each channel used by KARMA (and optionally, the Drum Track) in the Song. Do not record Channel 1 because you've already recorded that channel previously in Method 1. For most combis, the KARMA modules use Channels 2, 3, 4, and 5, and the Drum Track uses Channel 10. So you'll need to set up 4 or 5 new MIDI tracks depending on whether you're recording the Drum Track too. Set the input for each track to be its specific channel from the keyboard. Arm these new MIDI tracks for recording, but also be sure to mute the MIDI pass-thru from each of these new tracks' back to the keyboard. If you forget to do this, you will have multiple MIDI note loops and you'll get echoed notes when monitoring the sound from the keyboard in your mixer/speakers. You can't just turn Local Off on your keyboard to prevent the MIDI loop, unfortunately. Be sure that the two trigger/control tracks that you created using Method 1 (the Channel 1 tracks) are not muted. You want the MIDI data from these two tracks being sent to the keyboard during recording so that they can drive KARMA. Refer to the screenshot at the end of this section to see an example of how the MIDI track setup should look for the best recording results. Monitor the audio outputs from both your keyboard and your DAW, because you'll probably want to hear both your DAW's countdown and then the keyboard itself once the trigger/control tracks start playing. On your external sequencer, set the tempo accordingly and start recording. you'll see the KARMA (and optionally, the Drum Track) data being written to each of your new MIDI tracks while the trigger/control tracks play back the performance that you recorded using Method 1. If you examine the CC envelopes on the new recorded tracks, you'll see that no KARMA CC envelopes were recorded in them (which would be unnecessary and even troublesome for some uses). Remember to pass-thru the tracks' MIDI output to the keyboard (since pass-thru was off during recording). Remember to mute the KARMA CC envelope "control track" recorded in Method 1, because it would conflict wth the new tracks (since they are the output from that control track). You need to turn KARMA (and perhaps the Drum Track too) off on your keyboard. You might need to also disable the Combination Change filter in Global P1:MIDI, on the MIDI Routing tab, so that the trigger notes track doesn't initialize the combi and turn KARMA on automatically. Remember that if your external sequencer does not support SysEx (such as Ableton Live), what you hear will not usually sound the same as when KARMA itself is playing the same programs that are now being played instead by the new tracks. Note: unfortunately, the image below provided by the original author of this article is offline. This is why it's better to upload the images to the page, using the Files button at the bottom, so that the images are permanently associated with the article. This method is still unfinished; take the following with a grain of salt for now. To do this, you need to copy the Combi into the Sequencer, since only in Sequencer mode is the keyboard capable of sending the output of the 4 KARMA Modules to MIDI Output (while still sounding the internal voices). Even if you don't use the internal sequencer for recording/playback, you need to use this mode - think of it as a "multi mode". On the M3, disable recording of the KARMA CC envelopes and perform the KARMA MIDI setup, as described in the preceding sections. Find the Combi you want to record and use Auto Song Setup to copy all of its parameters into the M3's internal sequencer. Switch to Sequencer mode and note which tracks are enabled for recording on the Prog 1-8 and Prog 1-9 tabs of the P0-1:Play page. Press the REC/WRITE button to disable recording in the M3 itself. Go to Page P3 Track Param, and on the MIDI 1-8 and MIDI 9-16 tabs, set the status of all tracks that were enabled for recording in Step 3 to BTH. (This is essential to send MIDI data out from the M3 to your external sequencer. If you're seeing no MIDI input on your external sequencer, this is the culprit.) Note that you only need to record one track that is used by a KARMA module. For example, if a KARMA module is playing to channel 3 for three different tracks, you only need to record one of those tracks. On your external sequencer, set up a separate MIDI track to capture each channel used in the Song. Channel 1 will record what you play on the keyboard and pads, Channel 10 will record the Drum track, and up to 4 other channels will record the 4 KARMA modules' output. So you'll need 5 or 6 channels depending on whether you're recording the Drum Track too. Set the input for each track to be its specific channel from the M3. On your external sequencer, be sure to mute the send from the track's input back to the M3. If you forget to do this, you will have a MIDI note loop and you'll get echoed notes when monitoring the sound from the M3 in your mixer/speakers. You can't just turn Local Off on the M3 to do this, unfortunately. Monitor both the output from your M3 and your DAW if you're going to record only MIDI tracks, or Monitor only your DAW if you're going to record MIDI tracks and the total audio output of the M3 at the same time. On your external sequencers, set the tempo accordingly and start recording. When playing back the recorded MIDI, remember to unmute the MIDI track's output to the M3. You copy in the combi, using either the "Copy From Combi" Page Menu function, or the "Auto Song Setup" function, where you are in Combi Mode, and you press [Enter]+[Rec/Write] to copy the Combi to a new song. If using the latter, at that point, you can stop the seq and the metronome. Then you need to enable the MIDI Output of the KARMA Modules - go to 2-1a [Track Parameters][MIDI], and set the Track Status of each track to "BOTH" - this will enable it to send MIDI to your external sequencer. [_] Enable MIDI In to KARMA Module. With this method, you probably do NOT want to record the controller data from scene buttons, pads, sliders and switches - you should have them Off or set to "Default Setting" (not CC Default). This is done on Global 2-1b [Controllers/Scales][Controllers]. Use the "Page Menu > Reset Controller MIDI Assign" function to assign the "Default Setting" or "Off" settings. All external sequencers differ in how they need to be setup to handle this, but typically, you record all the output data into a single, multi-channel track, and use some kind of "Expand" or "unpack" or "Split Channels" function to separate each MIDI Channel into its own track after recording. Advantages of this method mean you have the actual output recorded into multiple channels, so you can copy, paste, and edit it like any other MIDI data - quantize it, remove a few notes here and there, shift it, etc. You can also just record your entire performance to a song in the M3's internal sequencer, and then save that song out to a standard MIDI file on your external media. Practically every major sequencer software out there will successfully import standard MIDI files into MIDI tracks. Ensure that your song is loaded into the M3's internal sequencer. From MEDIA mode, go to the Save tab. In the resulting dialog, press the > button and choose the specific song number that you want to convert to a .MID file. Press the T icon to give the file a name. Type 0 will merge all channels and their controller envelopes (and SysEx data if you choose to save that too) into one track. This isn't usually a useful format, but some sequencers can perform a "Split MIDI" function to break each channel's MIDI notes and CC/SysEx data out into individual MIDI tracks, if desired. Type 1 will keep each track with note/CC/SysEx data in it as its own separate track in the .MID file, so when you load it into your sequencer they'll already be on separate tracks, also with program change numbers if your sequencer supports that. This is typically the more useful of the two file types. You must select the EXCLUSIVE checkbox to save any SYSEX data in the .MID file. This is the only way to ensure that the MIDI playback is exactly the same as when KARMA itself is playing the programs associated with each module. # If you decide to keep the recorded KARMA CC evelopes in at least one of the recorded MIDI tracks, you must now edit the starting values for all 19 of the KARMA controller envelopes so that they start with the correct scene/slider/switch value that you recorded in Step 6. For example, if you started recording with KARMA set to scene 4, and then later switched to scene 2, the recorded controller envelope will start with no recorded value. So if you stop playback while in the middle of scene 5 and then restart the MIDI playback from the beginning, KARMA will stay on scene 5 for the beginning of the song until you finally hit the scene change to scene 2. So to ensure that KARMA starts on scene 4 when you play back from the start of the MIDI track, you must manually insert a starting CC value of either 3 or 4 depending on whether your sequencer uses base 0 or base 1 numbering, respectively. Use whatever method your sequencer supports to specify the correct combi or program bank slot selection, so that when you start the playback the right combi/program is selected first. The advantages of this method are that you can get your KARMA module's midi data into an external sequencer by working with a SNG file that you'd created and saved previously, without needing to re-record anything. There is no way to prevent the CC envelopes from being included in the .MID file, and therefore you'll end up with a lot of extraneous CC envelopes in the imported MIDI tracks in your sequencer. Typically you don't want these, except perhaps in the track that contains the trigger/control notes played on the keyboard itself, so you have to go remove all the CC envelopes from all the other tracks. Every track has program change information and these can all cause unpredictable results when played back into the M3 in any mode, so you typically need to remove all this information when playing back the file into your keyboard. (Or, you can disable your keyboard from responding to external program/combi change commands, in the GLOBAL section in page P1:MIDI, on the MIDI Routing tab, clear the Enable Program Change checkbox). You want the audio output from your keyboard playing on one audio track, and all the backing music from KARMA and your Drum Track on a different audio track. The easiest way to do this is to make your recording in two passes. First pass captures only the audio that isn't generated by KARMA and the Drum Track, and the second pass captures only the audio that is generated by KARMA and the Drum Track. There are many ways to set up for this type of recording, but the simplest approach is to first perform the MIDI Method 1 described above. This enables you to simply play back your recorded MIDI performance multiple twice, while you record only the audio from programs driven by the global channel (ch 1) on the first pass to its own audio track, and then only the audio from all other channels 2-16 together on the second pass to a different audio track. Run the 1/2 Individual outs from your M3 into your audio interface. Set the gain on your audio interface inputs to 0 db gain. In Global P0 Basic, on the Audio tab, set the L/R Bus Indiv. Out Assign to 1/2. This sends your Master L/R output out the 1/2 outs as well. In your external sequencer, load up the trigger/control track that you recorded using MIDI Method 1 above. Set up your M3 for recording using the MIDI Method 1, as described in one of the preceding sections. Playback your trigger/control track for a second or two to initialize the combi in the M3. On the M3 mute every track in the combi that plays on MIDI channel 1. This leaves only the KARMA-controlled tracks and the Drum Track playing (all of which typically use channels other than channel 1). Write your combi to an unused combi user bank slot. This is important because the combi change message at the beginning of your trigger/control track will reset the combi to its stored state, which will turn on the muted tracks again. Change the combi change command on your trigger/control track to load the newly-saved combi. On your mixer/speakers, mute the L/R audio output from your M3 so that you are listening only to the audio output from your DAW. Once you have your gain levels going into your audio interface correctly, arm the audio track in your sequencer and play control/trigger track again, this time watching your input meters for the track in your sequencer. If you have the ability to zoom (enlarge) your input meters in your sequencer, try to display the actual dB scale of the meter. Your goal here is to now adjust the output level from your audio interface until the input levels in your sequencer are reading -12 dB on the peaks from the loudest program material. Don't try to push the peaks above -12 dB (see the articles listed in the Closely related information section for the reasons why. Now play back your control/trigger track while recording the audio track. You'll end up with a well-recorded stereo track of all your KARMA modules and your Drum Track. Now that you've seen how this is done by playing back the MIDI recorded by using Method 1, it should be easy to adapt this procedure to work with the MIDI recorded by using Methods 2, 3, and 4. You essentially want the audio generated by Module A on its own track, the audio generated by Module B on a different track, etc., and the Drum Track audio on yet another separate track. In the case of KARMA modules that play multiple programs, you might even want the output from each program on its own track. This approach is essentially identical to the above, except that you must make more than one audio recording pass. For each pass, in step 6 you mute every track in the combi except for the specific track that you want to record, such as the bass line being played by one of the KARMA modules. When doing this, don't forget to readjust all of your gain stages per steps 10 and 11.